Num Nums is shy and sweet. read customer comments and latest special price on this page at Amazon." Mr sqiggles is the number one bestseller. read customer reviews and get the latest price on this page at Amazon. Chunk is the laid back surf hamster. Each pet hamster is programmed differently to the other pets. These hamsters interact with each other and their owners each in a different way. 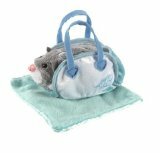 2010 will bring more little zhu zhu pets so look out for more little personalities to add to your kids collections. These battery operated no mess pets take 2 X AAA batteries. They are suitable for children ages 4 and up. Zhu zhu pets operate in two modes. 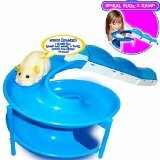 One is the explore mode.In this mode your hamster will scurry along either your floor or their own tracks The other mode is the "love mode". There is a button on your hamster's back to set this mode. When in this mode your kids can love and pet their hamsters. When you want to cuddle with or give your pet a reward pet it on the head behind the ears. Your hamster will chatter contentedly until it falls asleep. Press your pet on its back to watch it go. Hamsters love to run around and explore their environment. If you want to stop them running around pat them on the head or if you pat your hamster on the back it will yawn and go to sleep. Pipsqueak is a yellow hamster who is very speedy when moving around exploring , but who also loves cuddles. Your child will undoubtedly be happy with any Go Go Pet. They are in high demand. 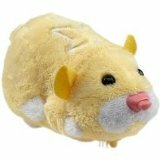 Finding the perfect hamster for your child will make this toy memorable Listen to your kids chattering to find out which pets will put the biggest grin on your kids face. This funhouse is the core habitat for zhu zhu pets. The core habitat is made up of a bedroom and a combined kitchen and bathroom with a piece of tubing. It can be expanded by adding additional modules and tubing. Your kids will have great fun building habitat layouts for their pets to explore. You don't have to have the funhouse for the toys to work however it adds to the kids enjoyment. The funhouse allows you kids to see their pet interact with it's own environment and allows for a greater play experience. Are Zhu Zhu Pets safe? 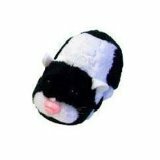 These pets became the hottest toy of 2009 when a relatively unknown California-based consumer protection website reported that the toys contained a risky amount of a dangerous chemical. Antimony is a chemical with a history of generating various nasty side effects--including cancer. The consumer website reported that Zhu Zhu pets had a higher than allowed level of this chemical. The manufacturer and respected governmental sources went on to give the toys a clean bill of health. The correct test brought back antimony levels well below the risk zone. These toys are now deemed safe for you and your kids to enjoy. When you buy your zhu zhu pets you may encounter a few difficulties as with every battery operated toy. To function at it's optimum your pat hamster requires interaction from you. Your pet will come with a guarantee. As long as you buy from a reputable seller you will have no issues with getting a refund or replacement if there is a problem with your pet. So what is to come in 2010. New go go pets in the shape of Jilly , Scoodles , Winkie and Nugget with their different personalities. Zhu zhu pet outfits to add to the fun. Zhu zhu babies Fritz, Snikle, Baby Cakes, Pumkin, Peanut. Muffin and Butter Cheeks. grab the kids and have some quality time together.